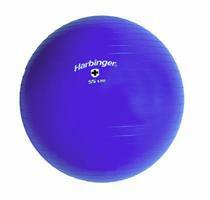 The new Training Ball from Harbinger enhances strength and endurance by helping you isolate specific muscle groups during training. The Training Ball from Harbinger also Increases balance and coordination as you incorporate it into your weight training, aerobic and resistance workouts. The ball has gripping ridges that provide excellent traction. 55cm in diameter for people who are 5'1" -5'6" in height, 65cm in diameter for people who are 5'7"-6'1" in height, and 75cm in diameter for people who are 6'2"-6'7" in height. Email your friend about the Training Ball. Ask a question about the Training Ball.